Before getting pregnant I was really anxious about the upcoming physical, emotional, and spiritual changes that would happen within me. There are so many books on "what to expect" when you're expecting and you can spend hours reading articles about pregnancy, but nobody really knows how each individual will be affected. Was I going to be nauseous? Would my fingers swell to the point of taking off my wedding rings? Would I feel an instant connection? What if there wasn't an instant connection... does that make me a bad mom? There are so many unknowns. BUT I knew one thing... this little baby had been prayed for, thought about, and talked about for way too long and I was excited to walk into uncharted waters in order to meet her! The beginning of the pregnancy was SO hard for me because I just wanted to scream "I'M PREGNANT!" to everybody that I saw. It was such a hard secret for me to keep, but I knew that we needed to wait a little bit longer to share our news just incase something happens with this pregnancy. I wanted to be cautious, but I also didn't want to stress my body by worrying about ALL of the "what ifs" in pregnancy. I was listening to my body, fueling it with the necessary nutrients (and Chick-Fil-A, let's be honest! ), and trying to enjoy the new changes within my body. Our little one was measuring 2-3 weeks ahead at every appointment, so we got regular sonograms to check her growth. This momma got SO spoiled seeing her at every appointment! Some days she would hide from us, but it always helped reassure me that she was healthy and thriving. I think I left every sonogram telling my husband, "Gosh, the human body is so cool!" Overall, being pregnant was such a positive experience for me and when I started feeling down or uncomfortable, I just had to remind myself how lucky I am that God chose us to be Luna's parents and he entrusted us with her life. I take that responsibility so heavy and am very aware of how lucky and privileged we are. To all of the women out there who are craving for their day to come, I see you! We had our maternity pictures done with the AMAZING Jenni from J. Noel Photography and she made this experience so special for us! It is always hard to be on the other side of the camera, but she made it effortless and fun! Thank you Jenni for these images...we will cherish them for forever! Maternity leggings. I lived in these on days when I stayed home and they were great for post partum as well! AG Maternity jeans. These were a bit of a splurge, but I used a 50% off coupon. I wanted to get nice jeans because I knew I would be wearing them almost everyday since I was mostly pregnant in the winter. Dress. 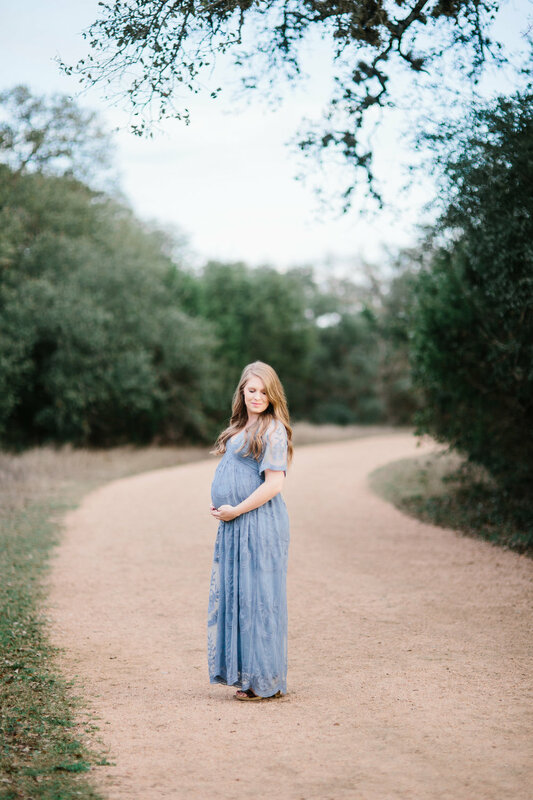 This is the dress that I wore for this maternity session. I loved it and can wear it non-pregnant as well! Belly Support Band. I did a ton of research before buying this and asked my OBGYN, and she said it was totally safe. You guys, this was a GAME CHANGER for me during my pregnancy! If I knew I would be on my feet for a while or doing any exercise, I would throw this on and it instantly helped my belly not feel so heavy. Towards the end of my pregnancy I think I wore this every night because my belly was stretching and it was causing pains and aches when I slept!